What is A Christmas Carol: A Christmas Carol is originally a novella composed by the famous English author Charles Dickens. Then it has been produced into films (musical or animated) by many companies, e.g. Mickey's Christmas Carol in 1983 and A Christmas Carol in 2009. Here we refer to A Christmas Carol written and directed by Robert Zemeckis and starring Jim Carrey in 2009. It is a 3D computer animated motion-capture holiday fantasy comedy-drama film that is the animated retelling of Charles Dickens' classic novel about a Victorian-era miser taken on a journey of self-redemption, courtesy of several mysterious Christmas apparitions. It is released in Disney Digital 3-D and IMAX 3-D, as well as a single-disc DVD and two-disc 2D Blu-ray as home media. Wanna Play A Christmas Carol DVD on Mobiles? Let's Firstly Rip DVD to Digital File. We can rip and backup both DVD and Blu-ray of A Christmas Carol for playing on portable devices. Here we focus on ripping DVD and playing DVD A Christmas Carol on iPad mini/Pro/Air, iPhone, Android, Samsung, Google Nexus , Kindle Fire HDX and so on, for kids. The DVD ripping theory is very simple: just extract the digital copy out of the DVD A Christmas Carol through which a DVD backup and video conversion can both be completed. However, Disney deliberately adds x-project DRM encryption to the DVD of A Christmas Carol, making it difficult to be converted even for personal and family use. Upon this, WinX DVD Ripper Platinum, a powerful and fast DVD ripping software, is on a roll to help you out. 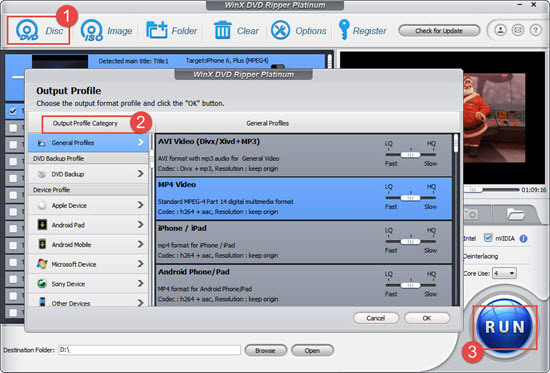 WinX DVD Ripper Platinum (for Windows, for Mac) can rip Disney DVDs, Christmas Disney movies, kids movies, animated films and any other DVDs to MP4/H.264, AVI, WMV, MPEG, MOV, FLV, etc. Besides, with 350+ built-in profiles, it can help users play A Christmas Carol movie DVD on iPhone, iPad and Android fast with ease. It also steals the shows of other programs alike with its easy to use feature. To get a better experience of copy A Christmas Carol DVD, please download it first. Step 1: Double click to launch the software, insert DVD to your DVD-ROM, click 'DVD Disc' button and wait the movie content to be loaded. The DVD ripper software also accepts ISO image and DVD (VIDEO_TS) folder as source file. Step 2: Choose a corresponding output profile and format according to your need among the 350+ built-in profiles, either iOS or Android devices are provided. Step 3: Hit the big RUN bottom to start fast ripping DVD A Christmas Carol. After the DVD conversion is OK, you may transfer and sync it from PC to your gadgets for playing A Christmas Carol video or music on your iPad, iPhone, Samsung, HTC, Motorola, Nokia, etc. WinX DVD Ripper Platinum also rocks in ripping other Disney, Pixar or other movie DVDs like rip Zootopia DVD, The Maze Runner, Guardians of the Galaxy, Dawn of the Planet of the Apes, The Expendables 3, Dolphin Tale 2, Maleficent, Hercules, Into the Storm and How to Train Your Dragon 2. It's quite easy to transfer the Christmas Carol movie clip to the Samsung, HTC, Sony, and more Android handsets via the USB cable, but not such to iDevices. 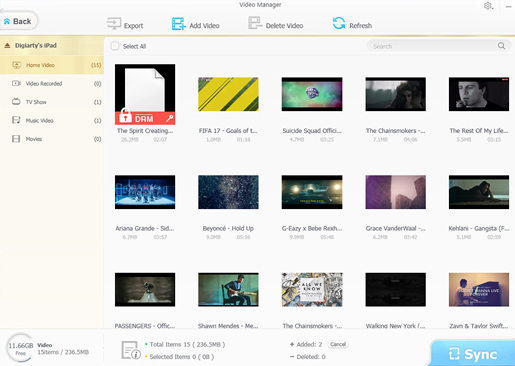 Generally, iOS users can move video from computer to iPhone iPad via iTunes, but in spite of the complicated UI, Apple owners often seek for best iTunes alternative for help. Here, WinX MediaTrans is recommended for its clean UI, stable performancem, and fast transferring speed. Connect the iPhone iPad to computer via the Apple-branded USB cable, and WinX MediaTrans will recognize the device at once. Click "Video" option on the main interface and then click "Add Video" to load the ripped Christmas Carol DVD movie video to a video folder of the gadget. Then just hit "Sync" to start the video file transport without blemish. After dozens of seconds, the movie video can be transmitted to Apple mobiles. Thus, just play the Christmas Carol DVD movie video using the default player. 1. If you need to Copy A Christmas Carol DVD to DVD to make a 1:1 backup without any quality loss, please try another utility - WinX DVD Copy Pro. 2. If you want to convert the video of A Christmas Carol from one format to another, please try VideoProc, e.g., M2TS to MKV, MTS to MP4, MKV to AVI, AVCHD to WMV, MOV, etc. 1. Rip A Christmas Carol DVD or other Xmas, New Year DVD movies effortlessly. 3. Continuesly updated to support the newest (Christmas) DVDs.